It’s holiday time. You’re in a rush. I’m in a rush. I’ll keep this short. For this week’s What’s Cooking Wednesday, you need three ingredients–prosciutto cotto (cooked ham), panna (heavy cream), and tortellini, preferably stuffed with prosciutto crudo. OK, you need salt and water too, but that’s it. I’ve seen other versions of this recipe that add butter, cheese, and even an egg yolk, but honestly this is delicious just like this, although, as always, I do encourage you to experiment. Feel especially free to add other ingredients to spice it up–peas or mushrooms are our favorite. You can also play with the type of pasta from fettuccine to pennette. It’s all good. 1. Prepare tortellini in salted, boiling water. 2. Meanwhile, heat cream in large saucepan over medium heat until it starts to bubble. Stir in prosciutto and lower heat, being sure that cream isn’t sticking to pan. I use a heat-resistant rubber spatula during this part. Keep the cream and prosciutto mixture warm until the tortellini are ready. 3. 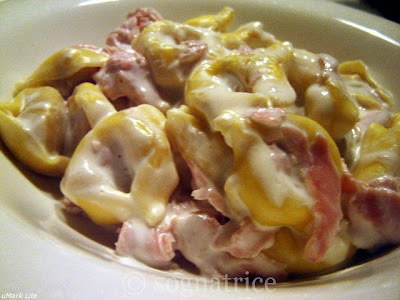 When the tortellini are cooked to your satisfaction, drain them, and combine well with cream and prosciutto. Simple and sure to be a hit with my fam. Hi Michelle, I hope you’ve been well. It’s been a while! I just wanted to say I love this dish and I always stock up on prosciutto crudo tortellini when I’m there to bring back for me and my family. So, so good and easy. Recipe sounds great, and so simple! My honey has a prosciutto in the garage fridge. Now I have to go get some tortellini and heavy cream. Unfortunately, we don’t have the prosciutto crudo tortellini over here in Ct as far as I know. So simple, yet SO yummy looking! Thankfully I held back from licking my computer screen. I don’t need to give my co-workers anything thing else to whisper about. LOL! excellent recipe. so quicky and easy. someone should send this to Rachel Ray, so she could learn something. This 30 minute meal looks delicious. Delicious! Can’t wait to make this. HMMM….easy and delicious looking, one I’m sure to try. Thanks! That looks so very good…I am dieting..boohoo! Have you seen the Ciobar offer in the store? I think I spelled that chocolate drink correctly. They are offering 15 packets of powdered chocolate along with a porcelean cup and saucer. Great for gifting and great for you. I think I may have to add some marinaded artichoke hearts! Thank you for your company this year- I’ve really enjoyed it -Really! I’m off to Melbourne to visit my family and especially my mother so I won’t be logging in until the new year. All the best for the Holidays and for 2008! I just made this the other night for my hubby – now that we can find real “Italian Bacon” here – yes that is what they call it – I can make this quickly and easily! It is so much better than plain boring red sauce! Buon appetito! 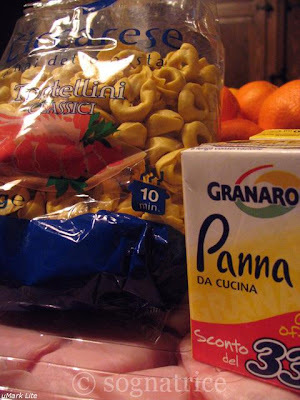 Ahhh, this is the best of Italian cooking, simple yet oh so delicious. They just don’t get here, why must EVERTHING have oregano and/or anise in it? Wish we could get the prosciutto crudo tortellini, so sick of the spinach and bad ricotta that’s put in anything farcito. Hmmmm…I believe I just challenged myself to make the tortellini at home, YESSSS! Right on NYC – I hope Ms Ray IS taking notes, after all, it really doesn’t count as 30 minutes when you spend an entire day washing peeling and pre-preparing all your groceries in advance, now does it? Oh how did you know that this is my favourite dish?? It’s the one thing I always request from my zia Lelia when I go visit Italy. I almost always start with this one after the gelato al limone, plus the pizza al prosciutto, and the pasticcini from Caldarola near my favourite piazza, and focaccia alle cipolle, and also frittata alle cipolle, and….oh I could go on! Brava for this one! Pictures are so good, I can almost taste it in my mouth! *Lisa, I, for one, cannot resist prosciutto. *Carla, glad to see you’re around; hope all is well with you too! *Karina, and, best of all, easy to make in one serving; I remember cooking for one very well, and this one is actually worth the effort (what little there is required!). *Sharon, I saw that offer about a month ago and have been kicking myself ever since for not picking one up; I’m going back to that particular store this weekend, so I hope they still have some…. *Italianissima, red sauce gets boring for the best of us, I agree! *Cris, I’m sorry to report that I have eaten every last Brazil nut that was in this house. I’m starting to look under things, just in case one rolled…. *Stefanie, I knew I’d get you sooner or later…. *Gil, to be honest with you, I’m starting crave it yet again…. Simple and delicious….my favorite combination!!! Yum, that looks so good! I’m a sucker for anything that has ham. And this dish is creamy at the same time! This pasta is everything I wanted for lunch today! *Robin, I’m with you there! *KC, I know…ham and cream…how can you go wrong? Wait just a cotton picking minute! Are those dried tortellini? For real? I have never even tasted them. There’s something just strange about drying tortellini… isn’t there? *PIC, mine too! Glad you like it! *Giusi, Giusi, Giusi…welcome to the world of dried tortellini! I never saw anything wrong with dried tortellini–in fact, it’s the only kind I can get here in the village unless I make it myself. And let’s be honest: making it myself really takes away the convenience of this meal…. You are so lucky that you can by tortellini that is good. It is very difficult here. The recipe looks like exactly what I crave! Huh! I betcha anything there’s a lady in your town that would make extra for you and I’ll betcha that some of your neighbors depend on her for their tortellini. When you come to visit, we’ll make something stuffed, although agnolotti are my fave. I’m having a hard time figuring out how the stuffing isn’t spoiled by drying, but I trust you. *Giusi, you know they don’t really seem to do tortellini around here. Or ravioli. Although they do a lot of stuffed vegetables, I don’t see a lot of stuffed pasta, but maybe I’m just peeking in the wrong kitchens…. As for the drying, I don’t understand it either, but it tastes pretty good–they don’t have a long shelf life though I don’t think. Can you even bake them? So they are like ” Oven-Tortellini” ? !